One of the most anticipated package tours of the summer hit the Northwell Health at Jones Beach Theater on Friday, June 29, as Joan Jett & the Blackhearts, Styx, and Tesla teamed up to provide an evening of familiar radio hits mixed with lesser-known, deep cuts. 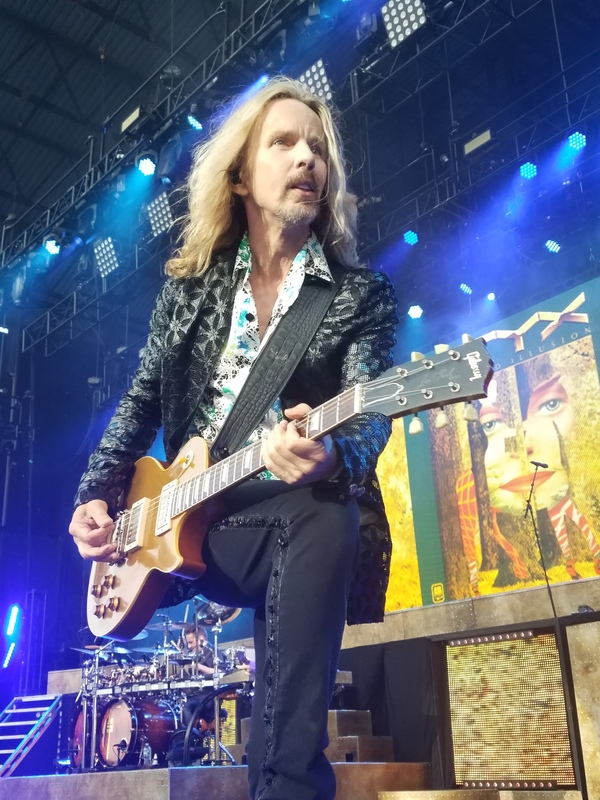 While each act had its strong suits, Styx, sandwiched between openers Tesla and headliner Jett, ultimately owned the night. Leading off with “Gone Gone Gone” off the band’s latest studio effort, The Mission, was an ambitious move, as the combination of coming from a concept record about a trek to Mars along with its uncharted status was risky. But it paid off beautifully as the tune succeeded in what it intended to do – bring the capacity crowd to its feet, where they remained for the duration of the frenetic 75 minute set. From there, the group delved into more classic material in the form of “Blue Collar Man (Long Nights)” and “The Grand Illusion,” the latter off the band’s 1977 seminal album of the same name. 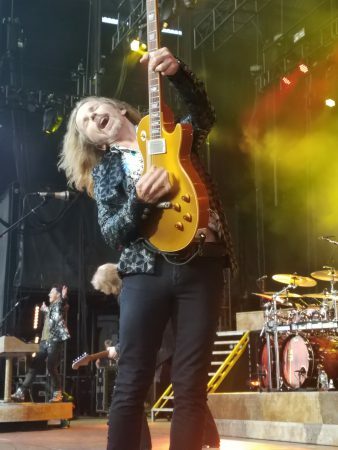 Trading off on the majority of vocals, as usual, were keyboardist Lawrence Gowan (click here for RF‘s interview with Gowan) and longtime guitarist Tommy Shaw. Gowan, a part of the Styx equation for nearly 20 years now, has more than earned his stripes. Replacing the beloved Dennis DeYoung in 1999 was no simple feat for the Scottish-born Canadian. But his engaging renditions of previous DeYoung standards such as “Lady” and “Come Sail Away” virtually guaranteed that no one in the venue was missing the former frontman on this night. The band also threw in a fun version of Queen’s “Bohemian Rhapsody” in the midst of Gowan’s lively keyboard solo. 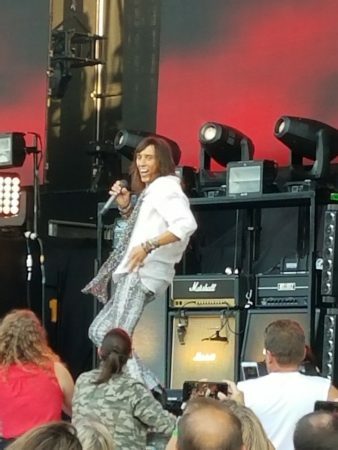 Original guitarist James “J.Y.” Young did his part on lead vocals during the gimmicky “Miss America,” a cornerstone of the band’s repertoire for over 40 years, while Ricky Phillips and Todd Sucherman, on bass and drums, respectively, maintained the beat beautifully for the Chicago-bred rockers. Founding bassist Chuck Panozzo, who originally formed Styx with his late twin brother John and DeYoung, guested on a few songs as well — a gesture of respect for the talented musician who’s no longer a full time member of the group. Perhaps the highlight of the performance was the inclusion of the popular “Mr. Roboto,” widely considered to be one of the most cherished tunes in the Styx catalogue. The song hadn’t been played in its entirety in 35 years until this tour so it was long overdue. And incredibly, it sounded as crisp as it did back in 1983 when it first appeared on the polarizing Kilroy Was Here album. It’s not often that a band with the pedigree of Tesla is in the position of opening a show. But to their credit, the Northern California quintet still managed to play a rousing, energy-filled, nearly hour-long set. From the blistering “Hang Tough” to the infectious cover of the Five Man Electrical Band favorite “Signs” to the muscular “Modern Day Cowboy,” the whirlwind gig appropriately left the punctual early arrivals yearning for more. Singer Jeff Keith’s trademark raspy vocals were as gritty as ever, sonically identical to when they were first thrust on audiences in the mid-80s, especially on the power ballad “Love Song.” Guitarist Frank Hannon and bassist Brian Wheat, both criminally underrated at their craft, were a treat to watch, while second guitarist Dave Rude and drummer Troy Luccketta added a welcome ferociousness to the band. Tesla are staying in motion with the release of their ninth full-length studio album, Shock, this fall. Whether you were looking for melodic metal, progressive compositions, or punk attitude, this was certainly a bill that had something for everyone. Click here for Joan Jett & the Blackhearts/Styx/Tesla tour dates.